Situated on the Greenwich Peninsula, next to one of the most successful entertainment venues in Europe, one might expect the InterContinental London - The O2 to be dedicated to solely to pleasure. But, visiting in June this year, just a few months after the grand opening, it quickly becomes apparent the hotel has been designed with business travellers in mind. With some of the best conference facilities in London, the hotel caters to events of all sizes, from small private functions to multi-day international trade shows. At the heart of it all is the Arora Ballroom - a football pitch-sized spaced designed with complete flexibility in mind. The largest ballroom in Europe, it can be adapted into multiple configurations, accommodating smaller or dual-purpose events or used in conjunction with as many as 19 additional meeting rooms on the mezzanine floor for seminars and breakout space. Furthermore, the 400 metre flat outdoor space at the front of the hotel can be utilised to add production showcase elements to live events, visible from across the water in Canary Wharf, or private marquees set up to bolster additional events space. 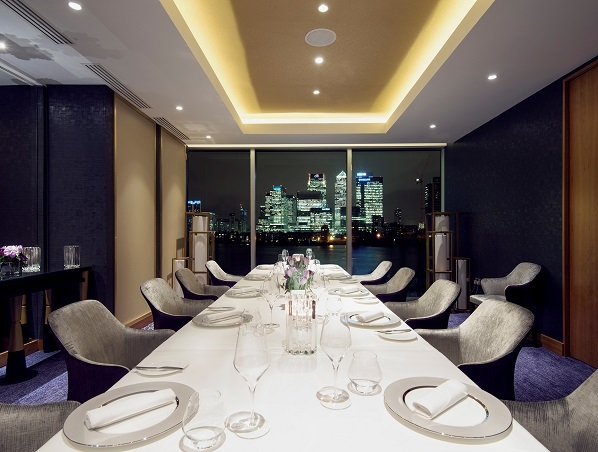 With London City Airport a few moment away on the Docklands Light Railway, Canary Wharf just a single stop across the river and a helipad under construction, this is the ideal venue for business events of any kind in the capital. That is not to say this is an austere property, dedicated only to work. The hotel is close to famous attractions within historic Royal Greenwich including The Cutty Sark and Greenwich Observatory, and the Maritime Museum, making it an ideal base for some of south-west London’s leading attractions. On a Friday night, the 453-room property is alive with noise and commotion, bringing a new level of glamour to the rapidly regenerating area of the capital. Located on the 18th floor is the stylish Eighteen Sky Bar - a sophisticated rooftop space exposing far reaching views of the London skyline. Offering a cocktail menu inspired by spice, herbs and botanics, the location welcomes guests with a full range of local and international craft beers, specialist wines, spirits and Champagnes. Loyal to maritime heritage of the area, the house-speciality is Clipper Gin, a unique artisan spirit produced for the property by the City of London Distillery. At 43.6 per cent proof, it remembers the Lighting clipper, which travelled 436 miles in a single day from Greenwich when the area was the centre of global shipping. Angela Brav, chief executive, Europe, IHG explained: “Much like InterContinental Hong Kong or InterContinental Paris Le Grand, this iconic hotel is set to become a destination in its own right, next to one of the UK’s most popular entertainment venues. Downstairs on the second floor the Peninsula Restaurant is an elegant dining room for 80 guests with a private dining space for up to 24. 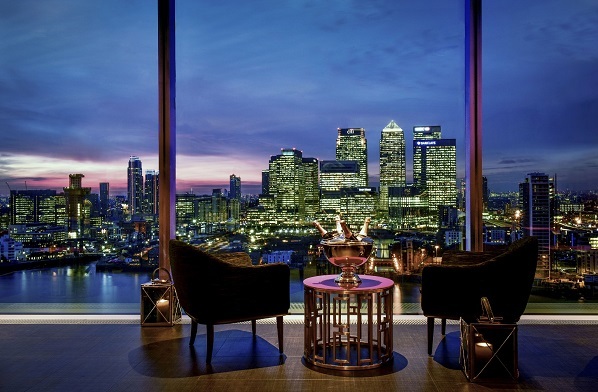 Sitting in the main space, the views over Canary Wharf and the Thames are spectacular, making it a real highlight of the hotel. Serving a daily fine-dining menu of modern European cuisine with a hint of exotic flavour reflective of the active spice trade that passed through East London’s docks, the restaurant is a perfect mix of sophisticated charm and relaxed indulgence. We are treated to the tasting menu during our visit, with everything from salt baked celeriac, with carrot goat cheese, and candied walnuts, to Rubia Gallega sirloin braised feather blade with kidney and barley casserole, on offer. The service here is also unrivalled, making any stay a pleasure. Set in the heart of the Intercontinental London – The O2, the spa offers tranquillity and relaxation to guests. The aesthetic here draws on the hotel’s location within historic Royal Greenwich and local influences of the East India Trading Company, with bespoke printed mosaic tiles, sumptuous rugs and delicate die-cut pendant lighting. A visit here is the perfect final flourish for a visit to this one of a kind property. Today, InterContinental is an award-winning brand, picking up accolades such as the coveted title of World’s Leading Hotel Brand at the World Travel Awards last year – an award it has held for six consecutive years. InterContinental London – The O2 will operate under a franchise agreement with Meridian Hotel Operations and will be managed by a division of the Arora Group. For more information head over to the official website. For more tours of the InterContinental London – 02 from Virtual World Internet take a look here.